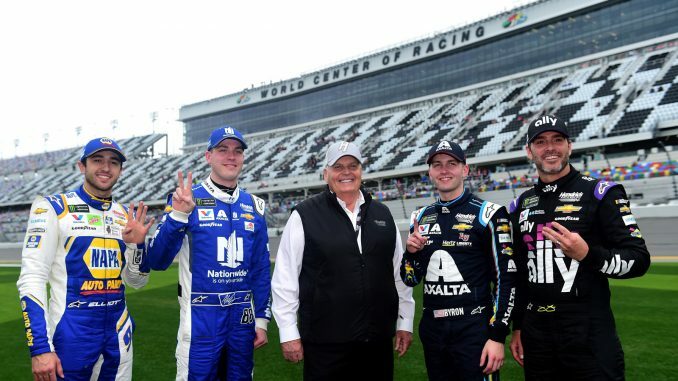 Rick Hendrick smiled widely and acknowledged that his team’s 1-2-3-4 sweep of Daytona 500 pole qualifying is as good an omen as his championship organization could hope for. He loves the historical significance and the present message about their preparation for the season’s biggest race. A couple hours later, he was in Victory Lane celebrating again – this time with his veteran seven-time champion driver Jimmie Johnson, who drove to victory in the rain-shortened Advance Auto Parts Clash non-points race Sunday afternoon. It’s been a good start for Hendrick Motorsports as NASCAR opens the race season. A victory next weekend in the official Monster Energy NASCAR Cup Series season-opening Daytona 500 would be the cherry on top. William Byron, the 21-year old second-year Cup driver earned his first-ever Monster Energy Series pole position for the sport’s biggest race – just besting teammate Alex Bowman and securing the front row for the organization. It’s the second time in the last three years the team has swept the prized grid positions. Johnson was third-fastest and fellow two-time Daytona 500 pole winner Chase Elliott was fourth. “It’s been a pretty awesome day,’’ Hendrick said smiling Sunday evening following Johnson’s victory in the Clash. It marks the 700th NASCAR Cup pole position for Chevrolet. 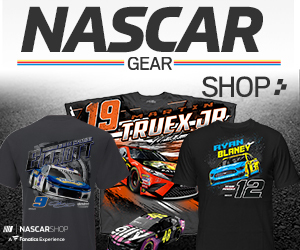 It is also the first time a team has swept the first four positions in Daytona 500 qualifying. It is a record fifth consecutive Daytona 500 pole for Hendrick Motorsports (Jeff Gordon 2015, Elliott 2016-17 and Bowman in 2018) and marks a record 13 Daytona 500 pole positions in all for the team. “Great day for Hendrick Motorsports and Chevrolet,’’ Johnson said from Daytona Victory Lane. Ironically, the day’s big winners – Byron and Johnson – were also involved in two major personnel moves in the offseason that Hendrick referred to post-race. Johnson’s long-time, seven-championship winning crew chief Knaus moved to lead Byron’s No. 24 Chevy team this season. Johnson got a new crew chief in Kevin Meendering. All of them were winners this weekend. “It’s really good for Chad to come out of the box with he and William to sit on the front row,’’ Hendrick said. “William is his age (21). So it’s a big morale booster. No secret we didn’t have the year we wanted last year, so coming out of the gate, no matter what happens, we get to celebrate this for a week. Johnson’s camp was equally as enthusiastic about what the strong start could mean for them, even though the Clash was a non-points race. Last year, he endured the first winless season in his entire full-time career. In fact, he had won multiple races each of his previous 16 years – a collection of 83 wins; tied for sixth all-time in the Monster Energy Series. “Couldn’t ask for a better way to start the year,’’ Meendering said. Johnson was equally as encouraged about what the strong showing on Sunday could mean. And he made no apologies for the close-quarter racing in the Clash that resulted in his first victory since June, 2017, at Dover, Del. “There’s different pressures put on each team, and certainly outside pressures of ‑‑ somebody came up with a great idea of who’s going to win first, Jimmie or Chad, and then the pressure, can we win again?’’ Johnson said. “There’s just different things that any and every team and driver deal with, so to work through that today and to win today just kind of, I think, helps with some of that outside pressure on where the team is. “And then internally, we’ve only talked about winning races. Kevin and I, this team have mentioned it many times, many different ways, I’m far from done. So for us today, there was no other thought process than to try to go out and win the pole and win the race, and we came close to doing both.